Writer Grant Morrison and artist Frank Quitely have created a book that will bring tears to readers’ eyes. Morrison, in interviews, has said he wanted to make a classic animal story that makes people cry – “Disney with fangs.” He and Quitely (along with colorist and digital inker Jamie Grant) have succeeded in that mission, telling a story about three animals – a dog, a cat, and a rabbit (otherwise known to their oppressors as simply 1, 2, and 3) – who are part of a United States Air Force project called WE3 that goes on clandestine military missions in high-tech clunky suits of machinery decked out with weaponry to kill American enemies. These animals are used as weapons, and are described as “animal slaves” who are exploited to save the lives of human soldiers. They are “living weapons” that are remote controlled using implants in their brains. After their most recent mission, the government tells the animals’ handler, Roseanne Berry, that the animals must be “decommissioned” to make way for new generation of modified animals. They have lost their usefulness to the government. Berry refuses to do this and purposefully lets the animals escape the Air Force facility in which they are housed. As they escape, they do what they were trained and controlled to do: wreak havoc on those who would harm them. Berry, because she shows them tenderness, is spared as they exit the facility. She expects death because of her complicity in the horror she has contributed in these animals’ lives, saying, “Kill me. I deserve it.” Morrison and Quitely, through their collaboration, express how she has contributed to the inhumanity of man’s actions, including the violence that it spreads around the world. The escape is breathtaking and one of the most intense put to paper. The layout for this scene, as well as the entire book, is bold and unique. The animals, because of the wiring attached to their brains, are able to communicate basic human words through a translator. When the animals are all together in a forest near an unnamed city, the dog, otherwise referred to as 1 by his government captors, says the word “HOME” to the cat and rabbit. This word is heart wrenching because, even though they have no human thought processes, they have inbred instincts. The dog knows he once belonged to a loving family. Each of them went missing from their homes and somehow ended up as the government’s killing machines. The dog is not the only animal to have an instinctual urge. 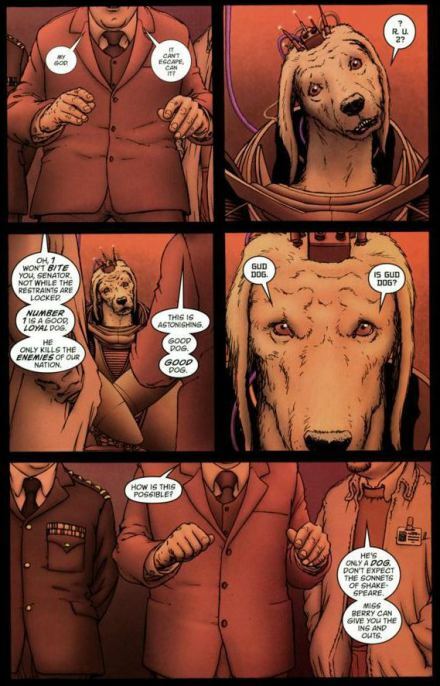 Morrison and Quitely have each animal convey a certain particular instinct through their words and actions. The cat, otherwise known as 2, has anger toward humanity and refers to the army and other humans as “STINKBOSS.” That anger is expressed in a scene where 2 shoots nails out of her mechanical claws and shoots a bird down from the sky in order to eat it. The rabbit, 3, constantly asks for food and for someone to fix her damaged tail. She simply wants to be free of physical pain. 3 also attempts to squelch dissent between 1 and 2 when they disagree on whether there is a home. 3 wants her pack to stay together. Writer and artist come together to build characters (who happen to be animals) and give them depth, evincing empathy from the reader. When the dog saves a man from wreckage of a vehicle crash, 1 says, “Gud dog. Help man. Gud dog?” Protecting others and expressing love is an instinct that cannot be removed from him. He’s confused because of the violence taught him and this confusion is expertly rendered by Quitely throughout the book in the folds and creases of the bewildered face of the dog. A sense of duty is inbred, but not a duty to commit violence. When the cat is being attacked, 1 tells the cat, “!2! 1 PROTECT.” The dog is expressing care for his fellow animal, willing to sacrifice himself for a creature he has grown to love. After soldiers have been killed by WE3 in the aftermath of their escape, one of the doctors in charge of the program says the “whole point of his work” was so that nobody would die. But, according to his logic, it’s perfectly fine for innocent creatures to be sacrificed and tortured in order to save human lives. Although the animals are shown as vicious killing machines, Morrison and Quitely expertly communicate, through words and art, their view that these innocent creatures have been bred to be violent. 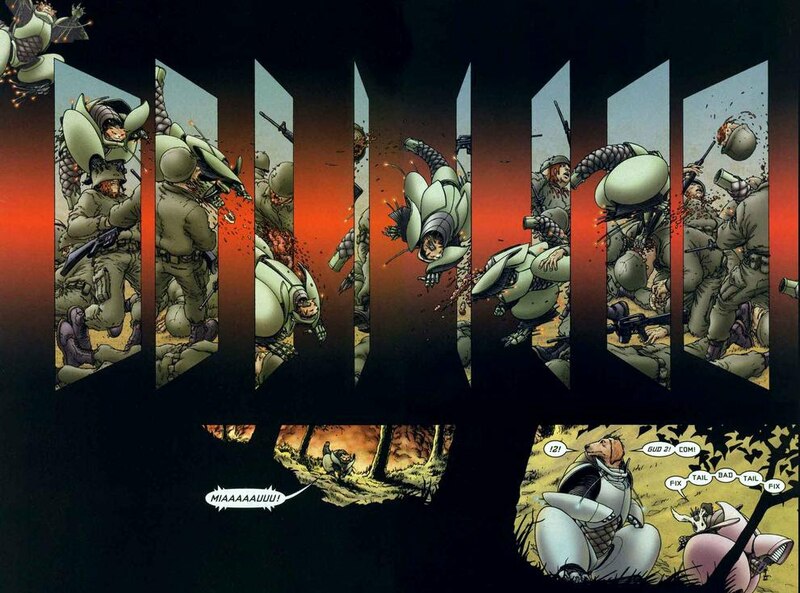 The violence in Quitely’s art is visceral, realistic, and extremely graphic. The constant utilization of close-ups and the minute detail in the panels add to the viciousness and reality of the brutality. Jamie Grant, through his coloring and digital inking, expresses a sense of movement and violence in the art. The blurriness in certain scenes of violence relates that movement, with the addition of closeups in the panels adding to that visceral quality. The effects of the violence and their escape from captivity on the animals is harrowing, with Quitely’s depiction of each animal’s face showing depths of despair and desperation. One scene has all three animals side by side, with tears and snot running down their faces. The reader can hear the panting and see the effects that man has had on them, conveyed in their eyes, creased stress lines in their faces, and their desperate mouths. As the book progresses, the exhaustion and heartbreak of these animals becomes more pronounced. It’s testimony to the genius of Morrison and Quitely’s collaboration and expresses why they are frequent artistic partners. Morrison and Quitely throw the reader into the journey of three living creatures that are attempting to escape the inhumanity of man’s actions. Human authority values human life over that of any other living creature, leaving 1, 2, and 3 no other option but to run and escape from what they have become because of humanity’s actions toward them. They were made into weapons but must fight in order to regain the natural connection and love that they so desperately crave. Grant Morrison demonstrates his versatility with WE3. He has such a diverse body of work, with such books as The Invisibles, his Batman run, and Animal Man in his oeuvre. No matter the genre or style of writing he utilizes, Morrison is able to make the reader think and feel with everything he lets out into the world. WE3 not only breaks our heart, but makes us think as well. Morrison writes amazing prose and dialogue in his comic books, with WE3 being one of the few where he uses sparse dialogue. The dialogue he does write is direct and every word has meaning. Great artists flock to Morrison and it is no wonder that Frank Quitely constantly collaborates with him. They have a rapport and a melding of brains that births great works such as WE3. The book is a true collaboration, each needing the other to make the book amazing. Notes and sketches on the process of making the book is at the end of the deluxe edition, testifying to the power and depth of feeling that these two creators brought to the making of this modern masterpiece.